Vietnam has the only waterslide park in the world devoted to Buddhism. 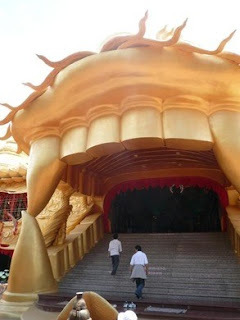 Here, sacred animals like dragons and unicorns take center stage, and golden monkeys make mischief with visitors as they take pictures and selfies. 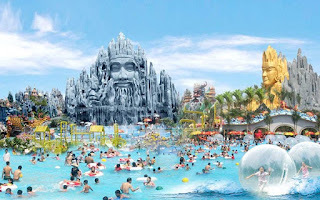 Suoi Tien Cultural Theme Park is a Vietnamese water-filled fantasy land, located 15 kilometers south of Ho Chi Minh City. 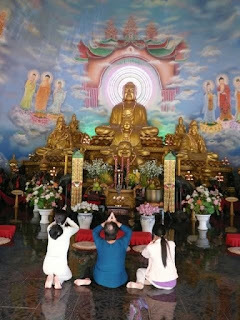 Suoi Tien is the world's first water park devoted to Buddhism, specifically the Southeast Asian animistic form of Buddhism. Take the children to visit the sacred animals in the form of the dragon, unicorn, tortoise, and phoenix used thematically throughout the massive water park. 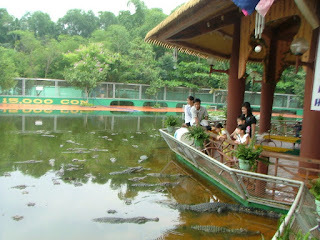 The park is located rather unromantically next to a rubbish dump, but denying the location, Suoi Tien is known as "the fairy stream.” The animism works well for the theme park; instead of Mickey and Daffy, Suoi Tien has chosen the dragon, unicorn, tortoise, and phoenix as its sacred animals, used thematically throughout the huge water park. Furthermore, workers in golden monkey outfits roam the park taking pictures with visitors and causing "mischief."